Uber. Lyft. Zip-Car. Bird. Airbnb. It's no secret that the “sharing economy” has staked a firm position in our everyday language. Over the past decade, the network of sharing economy businesses has grown significantly, expanding its reach across many industries and countries. These companies, almost all of which remain privately held, have re-shaped traditional business models and created exciting solutions for consumers. Capitalizing on the demand for convenience, flexibility, and unique experiences, companies in this space have paved new paths and built wide-ranging networks of individuals actively participating in the sharing economy. In the world of hospitality, major hotels chains have faced pressure to join the sharing economy. With Airbnb — a pioneer of the sharing economy — primed for a potential 2019 IPO, the pressure isn't likely to subside anytime soon. Airbnb’s Upcoming IPO Adding Pressure to Hurting Hotel Chains? In mid-November, Airbnb announced that its third quarter revenue exceeded $1 billion, the strongest quarter in company history. In January 2019, the company reported it was profitable on an EBITDA basis for the second year in a row, a significant accomplishment for any unicorn start-up. Additionally, it expects 500 million guest arrivals by the end of Q1 2019. In June 2018 reports surfaced that Airbnb would be ready to IPO as soon as June 2019. 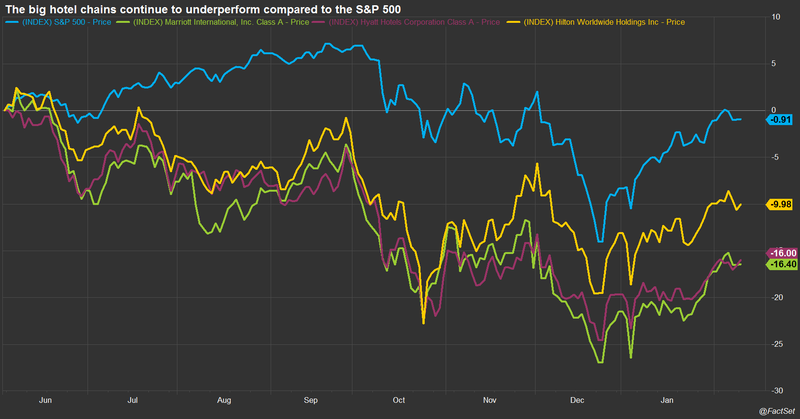 Coincidentally, the three major U.S. hotel chains began a seven-month slide at about the same time, underperforming the S&P 500 by an average of 10% at year-end. While there are many factors contributing to underperformance over that period, the continued shift toward a sharing economy is certainly on investors’ minds. As a leader in the sharing economy and competitor to traditional hospitality companies, Airbnb has slowly forced global hotel brands to reimagine their business models and invest resources to address the change in consumer demands. They are all facing the decision whether to enter, exit, or remain on the sidelines of the sharing economy. In the spring of 2018, Marriott International began a homeshare pilot in London with roughly 200 residences in its portfolio. Operating under Tribute Portfolio Homes, Marriott believed it could deliver a better product by leveraging its strong brand and loyal customers. After success in Phase 1, Marriott has moved into Phase 2, which includes three additional cities: Paris, Lisbon, and Rome. Adding four European markets to its homeshare portfolio in less than a year highlights its recognition of the changing landscape in the industry and its dedication to keeping up with consumer demands. Marriott is not the first of its competitors to try its hand at home sharing. Hyatt’s first encounter with the sharing economy came in 2014 when it made a significant investment in onefinestay, an upscale rival to Airbnb. It exited its position after French company Accor acquired onefinestay for $168.4 million. In a second run at home sharing in mid-2017, Hyatt placed a minority investment in Oasis, a high-end home booking company based in Miami, Florida. After incorporating Oasis into its rewards program in March 2018, Hyatt suddenly parted ways last October as Vacasa, a U.S.-based vacation-rental management company, acquired the company for an undisclosed amount. 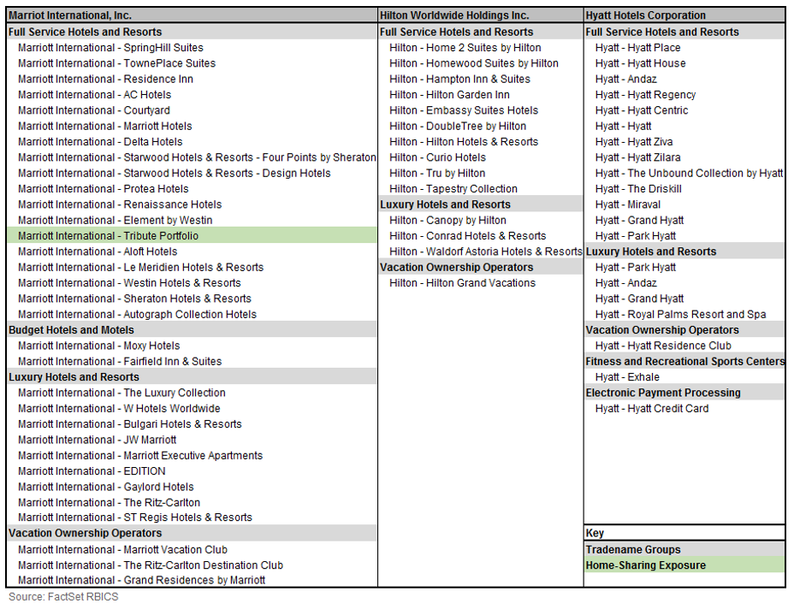 While its investments were short-lived, Hyatt proved its willingness to explore unique opportunities and assimilate home-share companies into its portfolio and rewards program. Hilton remains one of the holdouts. The firm believes it should not place a focus on homeshare at this time as its operations are different from companies like Airbnb. As it stands today, Marriott is the only one of the three companies with exposure to homeshares in its brand portfolio. Airbnb prides itself in its community of renters and hosts. History has shown how a strong community, tied to a disruptive company, can overhaul an entire industry. Amazon and its Prime members changed retail forever. Netflix and its subscribers transformed media content and consumption. Airbnb could soon find itself on a similar trajectory as it rapidly expands its global footprint and diversifies its revenue streams. Will an Airbnb IPO a have major effect on hotel chains? Probably not, at least not immediately. But just as many large retailers fell behind or closed their doors trying to catchup to the e-commerce giants, at some point in the future some hotel companies may find themselves wishing they had placed a greater investment in the sharing economy. John Davis, Consultant , also contributed to this article.